MSR AutoFlow XL Gravity. This extra-large AutoFlow gravity filter system delivers 10 liters of clean water fast—all while you set up camp, prep dinner or relax. And its big capacity means fewer trips to the river to haul the water you need. Similar in packable size to a 4L system, the AutoFlow XL system's durable flat base doubles the water volume for only 340 g (12 oz) of total weight. 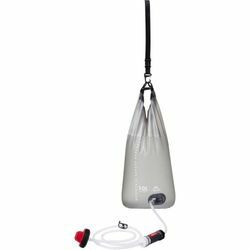 Ultralight and supremely packable, it offers the luxury of pump-free group filtration for basecamps, scout troops, horsepackers and other backcountry groups. And just one 10-liter fill of the reservoir can supply 1-2 people with a whole day’s worth of clean water. Fast: Uses gravity to filter 1.75 liters per minute, letting you multi-task at camp. Versatile: Separate hang strap and bag clip allow for easy hanging for maximum convenience. Rugged: Durable 3-dimmensional film reservoir with RF-welded seams and a 1000-denier flat base that resists wear-and-tear. Field-Maintainable: Sediment trap in bottom of bag; filter is easily cleaned on the fly, no tools required.